Summary: This Whatsapp Cleaner Pro is the best and powerful tool to clean WhatsApp Data. This Whatsapp Cleaner Pro is the best and powerful tool to clean WhatsApp Data. The best feature of the Whatsapp Cleaner Pro is that you can clean WhatsApp media from your Android phone or tablet automatically by a regular interval. 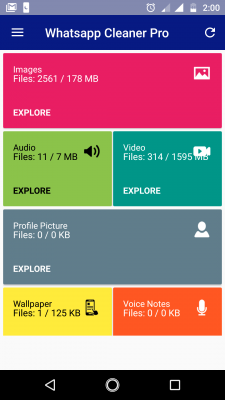 The main features of the Whatsapp Cleaner Pro: All WhatsApp Data/media in the same place. Delete a specified WhatsApp media file (image, video, audio and voice) or all media files by single click. Clean WhatsApp junk files by Category. Preview all WhatsApp media files types before doing a clean.